Compliance — you need to make sure that you operate according to rules and regulations of your area. Mission Planning — you need to specify what is the goal of the mission and how the drone should act to achieve it. 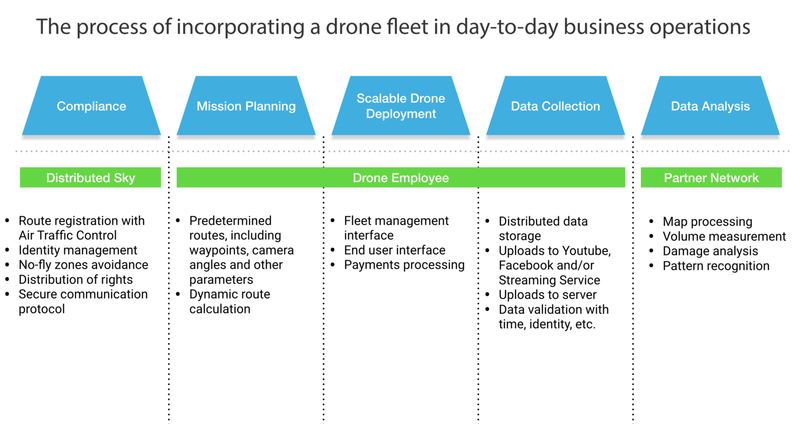 Scalable drone deployment — planning is 50% of a successful mission but you also need to make sure that everything works when time comes. The bigger the fleet of drone, the harder it is to manage it. Data collection — the actual drone flight. How you store, transfer and organise information is important if you really want to receive value from using your drones. Data analysis — processing of data collected by a drone. For example, a plan comparison on a construction site, or field water level for agriculture industry. At Drone Employee, we always thought that our mission is to cover the first 4 steps and then work with partners who specialise on analysis software our clients need in specific industries, such as construction or insurance. So we worked on the product which would work seamlessly for drone business owners up until the analysis stage. How do we organise a UTM system which works globally in a situation when no one can trust each other? How do we make sure that other parties would not corrupt the data with some malicious intent? And the last but not the least, how do we distribute the rights among international, national and local air traffic control systems without the risks for national security? All these questions need to be solved on compliance stage. What we realised is that this step requires a joint effort of all stakeholders in the commercial drone industry. After all, we all have to share the same airspace! We realised that the UTM system requires an independent arbitrage because all parties have to exchange information and work together, but none of them trust each other or want to share. Blockchain technology allows to set the rules which nobody has the power to change single handedly. This reduces the friction in building a global UTM system and is absolutely necessary for a project of such scale and complexity. The good news is that we are willing to share our efforts in order to build the better future for commercial drone industry. We decided to create a non-profit organisation which will work towards creating a global decentralised air traffic control system for drones. Welcome Distributed Sky! We already formed the core team of the project but we are always looking for new partners because, eventually, all of us will have to work together to make the compliance step effortless.